The Becker Traffic Assist satellite navigation system has a brilliant touch-screen display, voice guidance, 1 GB SD card and navigation data for 27 European counties. Music files stored on the SD card can be listened to via the MP3/WMA player on the headphones in unbeatable Becker sound quality. Becker Traffic Assist 7914 has been discontinued. Accessories, spares and parts are still available for your Traffic Assist 7914. The Becker Traffic Assist satellite navigation features a low-reflection, high-contrast 3.5'' TFT touch-screen display. The Becker Traffic Assist 7914 features four large pressure-sensitive panels for navigation, music, images and preferences along with a brilliant map display. The Becker GPS additional system configuration options can be activated by simply touching the screen. The Becker satnav maps can be viewed either in 3D or 2D and are easy to read thanks to 16-bit colour depth and 65,536 colours. The Becker Traffic Assist global positioning system guides you safely to any destination. An integrated MP3/WMA player guarantees maximum audio enjoyment while two standard batteries help keep you on track outside of your vehicle - in 27 European countries and a selection of 17 languages. The Becker Traffic Assist 7914 satellite navigation system is backed by years of experience in innovative technologies along with the legendary Becker GPS operating convenience. The Harman Becker GPS Traffic Assist is equipped with an integrated GPS receiver and a fold-out GPS antenna. Install it in your vehicle using the included windscreen mounting kit. Connection cable for cigarette lighter socket also included. The Becker satellite navigation 1 GB SD card stores comprehensive map information for up to 21 different countries. Data for 27 countries can be transferred to the SD card via USB interface from the accompanying navigation DVD. Database: NAVTEQ (regularly updated by our software service) Andorra, Austria, Belgium, Czech Republic, Denmark, Finland, France, Germany, Greece, Hungary, Ireland, Italy, UK, Liechtenstein, Luxembourg, Monaco, Netherlands, Norway, Poland, Portugal, San Marino, Sweden, Switzerland, Spain, Slovakia Republic, Slovenia, and Vatican City. 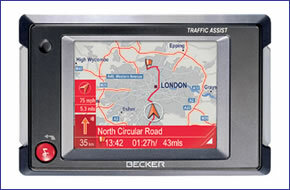 Looking for accessories to use with the Becker Traffic Assist 7914 sat nav? We sell a vast selection of genuine parts and spares including Traffic Assist 7914.